My day again started around 3:30 AM. (My body clock is nothing if not consistent.) I pounded out another blog post over an in-room breakfast, and again, headed out to catch the 7 AM shuttle. This time, I had an official Press Breakfast to attend at the New Products Center. I had eggs with all the fixings, courtesy of the USCCA, and then checked out the new stuff before the rest of the show attendees arrived later in the morning. Honestly, oftentimes the new products are just rehashes of existing stuff, but I did find a few things that interested me. 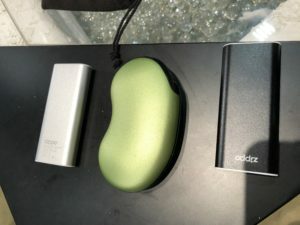 The new product that grabbed me the most was a USB chargeable Handwarmer from Zippo. Anybody who knows me well, knows that my hands are ALWAYS cold in the winter. I have been known to warm my hands over the computer vent on my laptop in the office between patients. I use the single use Hot Hands quite often, but I hate throwing them away when I’m done. I also recently got myself a set of reusable hand warmers, but they have to be boiled in order to recharge them. Zippo also makes hand warmers that use liquid fuel, but for me that is inconvenient and messy. But THIS new product simply plugs in! It can also be used to recharge your cell phone in a pinch. There are two models -the smaller will heat for 3 hours and the larger will heat for 6 hours. I don’t have any information on price or other specific details at this point, as when I visited the Zippo booth, the press kits has been mislaid and the person I needed to talk to had gone to lunch. BUT – I have contact info and will be following up closely, because I think I need this in my life – LOL! Stay tuned on this one. Another new product I found interesting was a UV water bottle that supposedly makes your questionable water potable in 3 minutes. I stopped at the EGISMOS booth to check this out, but was again stymied by a lack of information. The fellow there showed me a smaller version, as he said that the only one of the larger style they even had was the one actually IN the new products display. He could not give me a price range, a website or any other details. That seemed a bit odd to me. I guess that is a drawback to a “new” product – but why display it if it is SO new that there is only one in existence? Things that make me go Hmmmmmm. So, after that experience I decided to stick with products that are already fully on the market. a dressy reversible carry belt from Crossbreed, and some new quick safes by Hornady – one of which is designed for the car. 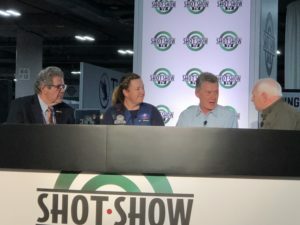 I checked out the new S&W Shield 2.0, and asked some questions in the CZ booth at the request of a friend. I also fondled the new Sig 365 9mm subcompact carry pistol. That last entry deserves a paragraph or two of its own. 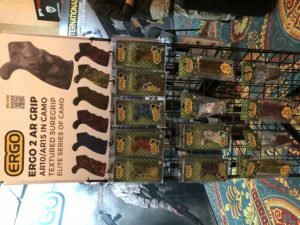 Sig has a solid reputation and builds quality guns, and they have rocked the market in recent years with the P320 and a subsequent military contract. 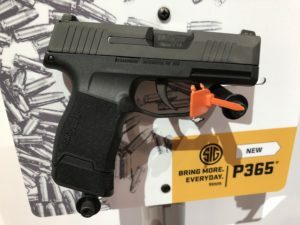 The P365 is Sig’s new contribution to the 9 mm striker fired subcompact carry market. 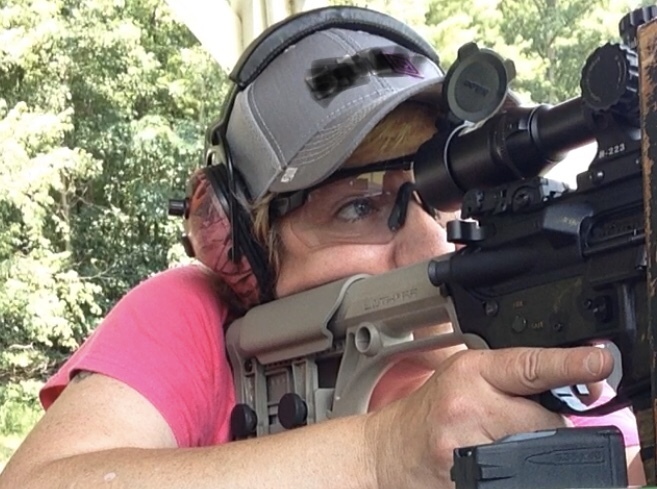 Sig has their own range day, and I am not well-known enough to be invited, so I didn’t get to shoot this new pistol. But my friend Annette Evans did, and she assured me that she was impressed. 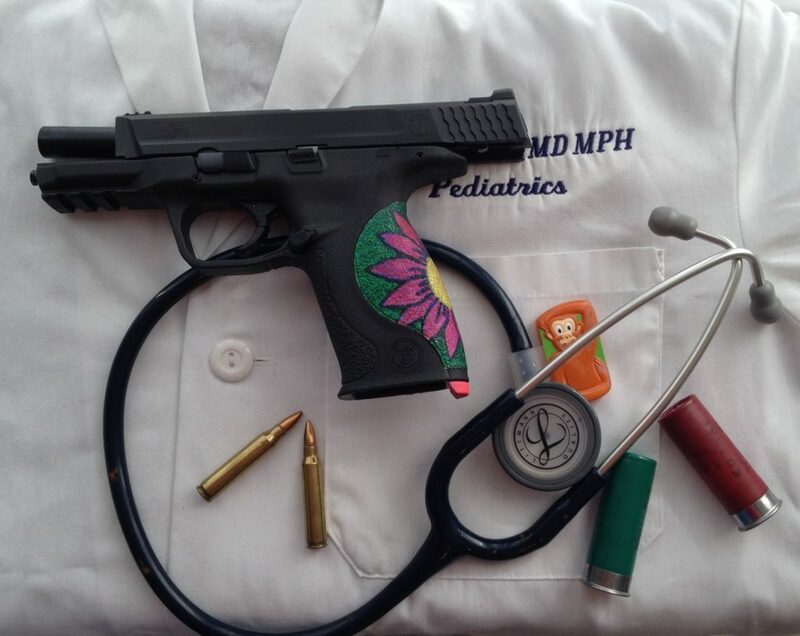 Handling the floor model alone was enough to have me questioning my status as a Glock Girl. This little gun fit my hand nicely. It measures 1 inch wide, by 4.3 inches high, by 5.8 inches long. It comes standard with Siglite night sights, and is striker fired. The trigger pull was awesome – nice and crisp. But here’s where it really grabbed me – it has a ten-round 9mm magazine standard, and there is a plus 2 magazine extension. When the booth rep popped that plus 2 mag in for me, the hand fit went up exponentially, and I suddenly had 12+1 gun in my hand – at the size of my Glock 43. Yes, really. Forget all the new carry guns I’ve talked about getting. I want THIS one. The rest of my day was mostly “peopling” and making contacts. 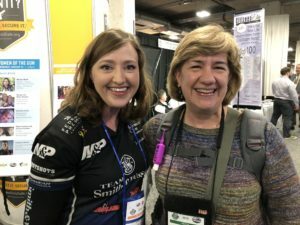 I watched Olympic champion shotgunner Kim Rhode do an interview about Kids and Clays – the charity shoots supporting Ronald McDonald Houses at children’s hospitals around the country, one of which I hope to get involved with locally. 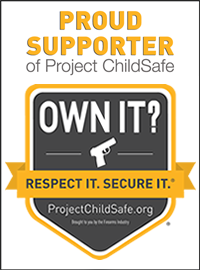 I attended the “Women of the Gun” function at the Project ChildSafe booth, to promote Gun Safety and Safe Storage. I also visited RMR bullets and American Reserve Munitions, who have been making and selling the Monster Hunter International ammo, with author Larry Correia donating his portion of the proceeds to Texas Hurricane relief. And some meetings are just serendipitous. One my way out of the show, I stopped at a booth that had “blue guns”(and blue hand grenades, and rubber wrenches, and crowbars, and all kinds of stuff). I made some kind of funny comment, and the guys next to me struck up a conversation. Turns out that they run Keystone Sporting Arms, which makes Crickett and Chipmunk rifles for small children. We had a great conversation about our common interests in kids and guns and safety. Nice guys. I also managed to stop at Gerber for a free beer, and Leupold for another free beer – and some free cups. I’m thinking that there might be a small advantage to being female when it comes to swag. Most of the people giving out stuff at booths are female. I think when they see another woman, their generous streak kicks in or something, because I’ve been given extra souvenir cups, double t-shirts, double water bottles, and handfuls of stickers that I’m thinking the average tacticool beard guy isn’t getting LOL. My friends at home who don’t get to come to this are always appreciative, so I’ve stopped feeling bad about it. Also, I have not provided links to these companies and products, because at this point it would take me another hour, and you all are probably internet savvy enough to find them on your own. The Show isn’t over yet, so keep checking back here and on social media. The Zippo USB handwarmers are already available. I’ve had my eye on them ever since they first started rumoring them. My hands are always cold and I hate the waste of Hot Hands, but don’t like using my traditional Zippo “fuel” handwarmers except for when it’s really cold because of the hassle and need to keep them upright. Thanks Dr. Latebloomer. Appreciate the information you’re providing those of us that can’t make Shot. Keep the info coming.